Star Wars: The Clone Wars: a guide for parents of inquisitive children. A guide to the Clone Wars for parents of inquisitive children. 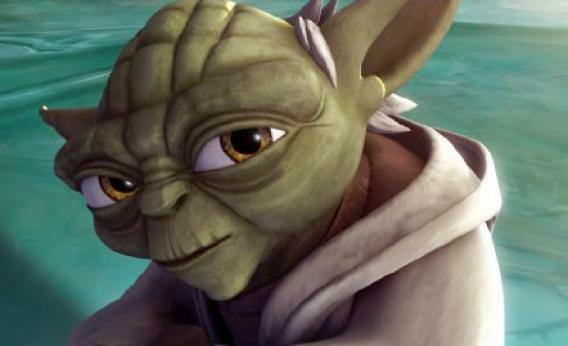 Yoda as he appears in Star Wars: The Clone Wars. Still from Star Wars: The Clone Wars © 2011 Cartoon Network. All rights reserved. I have a 6-year-old son who asks lots of questions. We’ll be walking to the subway when he’ll drop a mission impossible on me: “Where is Jesus Christ buried, Daddy?” I’m fairly decent at answering questions involving religion, baseball, state capitals, and Earth science. (Pop quiz: Do you really know why it gets colder in the winter?) But there’s one particular field of knowledge where I’m bereft. I don’t know much about Star Wars: The Clone Wars. Separatists? Count Dooku? What the hell? Like any mainstream American boy in the 1980s, I inhaled the original Star Wars trilogy. If you tell me that something “will be just like Beggar’s Canyon back home,” I’ll bust out my best womp rat joke. I watched the new trilogy through a haze of disappointment. I can barely remember what happened in the last one, as I was still recovering from the blasphemy of a fast, Rambo Yoda. George Lucas’ creation is unstoppable, of course, and the franchise continues to metastasize. My son craves Star Wars Legos and reads the excellent series of graphic novels that tells of the Clone Wars. Which is great, except I can’t explain all of the subtleties to him. Herewith, as a public service, a guide to the Clone Wars for parents of inquisitive children—plus a bonus section on R2-D2 for 3-year-olds. For starters, forget about Luke. The Clone Wars are all about Anakin, who as we all know becomes Darth Vader (though I always fudge this detail so as not to ruin potential future surprise). Obi-Wan Kenobi is Anakin’s teacher. Anakin has R2-D2 in his ship, plus he built C-3PO. He’s the strongest and fastest Jedi, but he doesn’t listen. His lightsaber is violet in color. Important note for parents of girls: Anakin will secretly marry Padmé Amidala (aka Natalie Portman) and give birth to Luke and Princess Leia. Best not to mention that Padmé dies during childbirth. The most confusing aspect of the Clone Wars for original-trilogy (O.T.) parents is that the clones’ body armor makes them look a lot like stormtroopers. (In fact, the clone troopers become the Imperial stormtroopers. More on that later.) Yet the clones are good guys whose blaster “bullets” are blue. The original DNA used to create them came from Boba Fett’s dad. (Boba Fett had a rather tender home life, it turns out.) The Jedi lead the clones in battle against the droid armies. Here again, confusion. An O.T. parent hears “droid” and thinks R2 and C-3PO, but, no, the droids are tan, spindly robots, and their blaster color is orange. They are typically controlled by a droid mothership and can be dispatched by Anakin and Obi-Wan in large numbers since they are dumb. It’s much sadder when clones die because of their human form. Lucas screwed up here. To summarize: Republic + Jedi + clones + blue blasters vs. Separatists/Confederacy + Dooku + droids + orange blasters. Onward. The Jedi use the light side of the force, while their ancient enemies, the Sith lords, use the dark side of the force. Major spoiler alert in the next sentence for those who haven’t been paying attention! Chancellor Palpatine, a distinguished looking gentleman who dominates the Senate, is actually the craggy, white-faced emperor from The Return of the Jedi, also known as Darth Sidious. Before he’s unmasked as a Sith lord, he plays both sides of the Clone Wars, undermining the Jedi and fomenting conflict so that he can lead a newly formed Galactic Empire. This is the good old Empire with the Imperial star destroyers, incompetent generals, and TIE fighters that O.T. parents know and love. The proper order of the Star Wars galaxy comes completely into place with the Great Jedi Purge. During a key moment in the Clone Wars, Palpatine issues order 66. To give due credit: this is the amazingly poignant montage in the sixth movie where the clones turn on the impressively diverse Jedi and mow them down. A most epic disturbance in the force. Clones are created to follow orders and 66 is a command to destroy the Jedi if they are a threat to the Republic. That’s not true, Palpatine is simply being evil and establishing his power. The clones now become his personal army of stormtroopers. Nearly all the Jedi are decimated except for Obi-Wan and Yoda. Unfortunately, because Jedi are awesome, your kids will ask you questions about random Jedi like Kit Fisto, Mace Windu, and Plo Koon. Trust in Wookieepedia, you must. In addition to the Separatists, the Trade Federation has droids and is generally up to no good in a greedy banker way. It’s safe to ignore the Trade Federation. Chewbacca and the Wookiees have their own unspellable planet now. They live in primitive style, like more badass versions of Ewoks. Jar-Jar Binks is a Gungan. I think the Gungans live underwater. Naboo is the planet where Padmé is from, but the adjective Nubian refers to the planet Nubia. The Skywalkers are from Tatooine—two suns, podracing. Count Dooku gives the plans for the Death Star to the emperor. Padawans can be thought of as Jedi middle-schoolers. Ahsoka is definitely a girl. Hayden Christensen can’t act. I really have no idea who that scary albino bald woman is, sorry. The Force? How does the Force work, you ask? The Force “surrounds us… and binds us.” It is biological in nature, as individuals who are “Force-sensitive” have a lot of these things called midi-chlorians in their blood. You can definitely use the Force. It’s never, ever a good idea to use the Force to choke your little brother. Q: Does R2-D2 have shooters? A: Yes. He does have a shooter in his body. He also has a propeller, a lasso, and shock arm. A: Yes. But only for short distances. Q: What does R2-D2 eat? Q: Who is R2-D2’s friend? Q: Why does Daddy talk funny when he is C-3PO’s friend? A: Daddy does a bad British accent. Q: Is there a bad R2-D2? A: Yes. There is an assassin droid that is a bad R2-D2. A: Yes. R2-D2 always goes to sleep quickly without asking for water. My Star Wars research reveals that Princess Leia and Han Solo get married and have three children. Plus, R2-D2 gets handed down through the Skywalker family like a trusty old hunting rifle. He is currently helping Cade Skywalker (directly descended from Luke) fight a restored Sith empire.